I totally forgot to mention the Carnival of the Recipes for last week! It's up at Curmudgeonry, who has done a wonderful weather-wise job. :) I'm posting my contribution for this week's carnival early, so I don't forget. Yesterday we had the family here for a little gathering - out of town cousins come to visit - and I made a fruit platter with a sweet dip that was to die for. I got this from my friend Alice, but I don't know how close I got to her original. I guessed at the ingredients and amounts, just kept adding stuff until my mouth exploded. The result was apparently as good to everybody else as it was to me, because there was none left. Mix together. 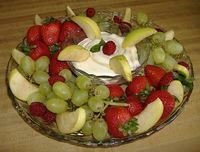 Serve with fruits for dipping. I had a good variety of summer fruits - strawberries, raspberries, apples, grapes, and three kinds of melon cut into chunks - with toothpicks for spearing the smaller fruits. To serve this for an afternoon tea in a more genteel way - put a spoon in the bowl so folx can put the dip and fruit onto their own plates and return to their seats. My family didn't stand on ceremony, they just gathered round the platter and gobbled. Double dipping was rampant, and cheerfully ignored. In fact, I think the first bowlful was gone in about 10 minutes. Good thing I made another, but next time, I'll probably double the recipe. My kids like this very much... thanks you! Thanks Cin! :) You're exactly right about the sour cream, it added just a touch of tartness. I'll have to try it with flavored cream cheese next time. Thx! This looks wonderful! I've had a version of this where equal parts marshmallow creme and fruit-flavored cream cheese are used, but I like the idea of adding sour cream. I bet it smooths the texture and adds a nice tartness.